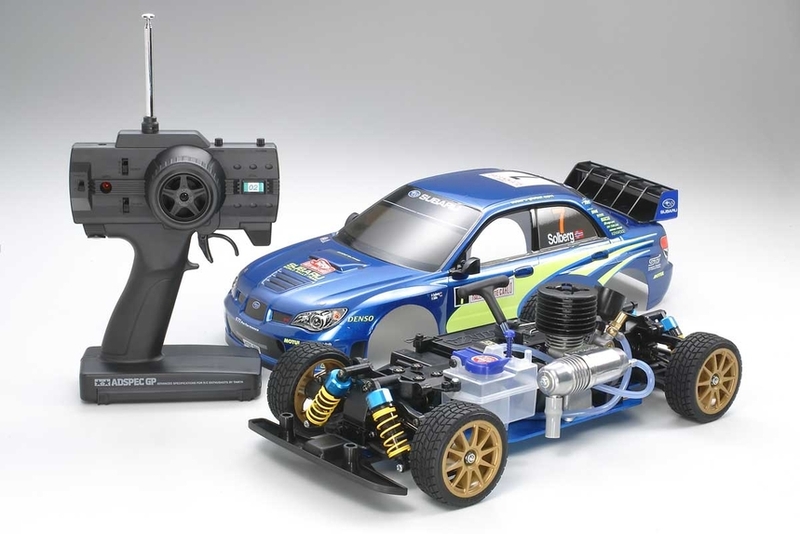 Tamiya has had a long history of releasing R/C models of real-life World Rally Championship cars, and this year sees the announcement of the new Subaru Impreza WRC Monte Carlo '07 on the high-performance TNS-FD chassis. The latest iteration of Subaru's Impreza WRC rally car is outwardly not too different than the 2006 model. The main improvements lie underneath the hood, with improved suspension geometry, a new turbo/intercooler, better weight distribution, and new differential settings for greater traction. There is also a new front bumper design to go along with the new intercooler. All of these enhancements aim to make the Impreza WRC 2007 a more responsive race car, and drivers Chris Atkinson and Peter Solberg have already attained positive results with 4th and 6th place finished respectively at Round 1 Monte Carlo. Fully assembled TNS-FD chassis with 2.5mm aluminum alloy lower deck. featuring oil-filled dampers and sealed front end rear differential gearbox. Powerful 2.1cc FS-12FD glow engine with pull starter provides reliable racing performance. Subaru Impreza WRC Monte Carlo '07. Includes Tamiya Adspec GP R/C system. Wide range of option parts separately available.